Gather supplies, such as flashlights, sturdy shoes, food, water, and a first aid kit. Store supplies in an easy-to-access location. Visit ready.gov for more on building and maintaining your kit. Heavy objects that can be dangerous if they move or fall during an earthquake. Secure bookcases, electronics, appliances, and any other items to walls with fasteners, or move them away from beds and seating. Identify a meeting spot for friends and family. Pick an emergency contact, someone out-of-state to coordinate with. Everyone should know this person’s phone number. Reinforcing older homes—bolting them to the foundation, reinforcing the “cripple wall” between the first floor and the foundation and shoring up weight-bearing posts and beams—helps them stay standing after an earthquake. A seismic retrofit can also help you get earthquake insurance, and since your home is your biggest investment, make sure it’s protected. Portland has about 100,000 older homes that may be vulnerable. Learn how our non-profit can help you retrofit, and secure a spot now for a seismic assessment. Enhabit (formerly Clean Energy Works) is a non-profit organization headquartered in Portland, Ore. that’s focused on building more resilient communities. 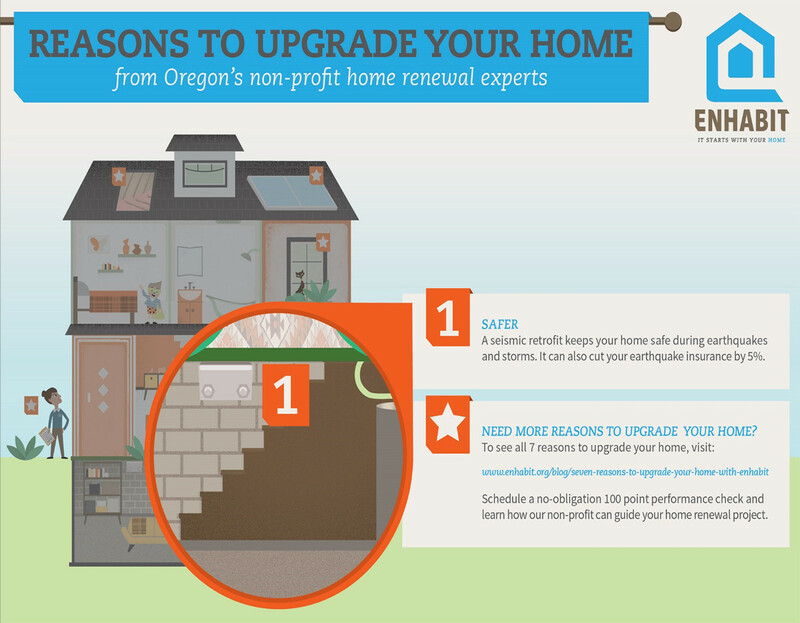 Enhabit is the next step for homeowners who want to make their homes work and feel better. From the initial review of your home, to choosing a trusted contractor and financing to make the right efficiency, health and safety upgrades affordable, Enhabit is committed to high-performance home renewal that makes sense.